The Magento eCommerce Website Platform. 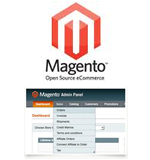 Magento is currently the most popular, free open-source eCommerce Website Platform. eCommerce software such as Magento gives web developers total control over the look, content and functionality of an eCommerce store. The Magento framework is powered by PHP and MySQL. The Magento eCommerce Platforms provide the scalability, flexibility and the features that allows users to easily develop a variety of flexible e-commerce websites & e-commerce applications. The Magento tools and components can build just about any e-commerce website, including cheap e-commerce websites, standard shopping carts, multiple shopfronts, online transactions, plus much more. Even if you have never used a Magento Gold Coast CMS website, the intuitive administration management tools give merchants the power to create profitable website stores Magento is an ideal solution for your online shop..